Diner table discussion and chit chat in a family get together are always very interesting. Recently in such situation my uncle was saying about his first trek to Sandakphu in mid 70s. I was adding more spice to his memory recollection by sharing my experience during Sandakphu Trek. Suddenly my parents expressed their interest for a week end trip to North Bengal but they asked not to plan for any trek, instead, they it would be better to stay in a village near to Darjeeling preferably in a tea garden and forest. When everybody of the table agreed to their plan I ran a search query in my mental database and retrieved the name of Rangaroon Tea Garden. 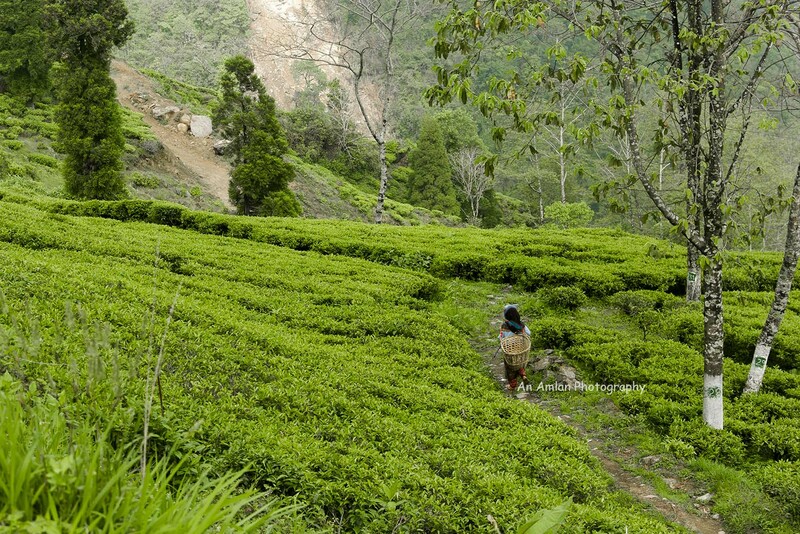 Rangaroon Tea Garden is 16 kilometre away from Darjeeling. 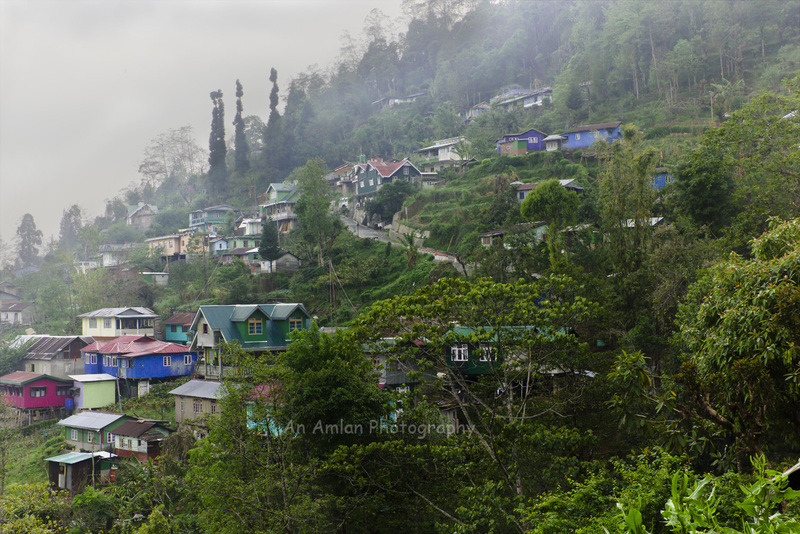 Located on the opposite hill of Darjeeling, this hamlet can be reached by car either via Kurseong-Jorbangla-3 Mile Mor of Via Teesta Bazar – 3 Mile Mor. Next morning, my first job was to issue tickets for New Jalpaiguri (as NJP is the gateway to go North Bengal) and after getting six births in Darjeeling Mail I booked Khalling Cottage of Rangaroon Tea Estate for two nights. This time our team consisted of six members – my parents, uncle, aunty, my cousin sister Sanghamitra and myself. We reached NJP in a cloudy morning. Cottage authority arranged a car for us that took us from NJP. While going through Rohini Road, we experienced light shower. I love to see shower on a tea garden. The sound of rainfall on a tea garden refreshes me like anything. Suddenly our driver said, “Mausama kharaba cha. Kanchenjunga herna kunai mauka” (Weather condition is bad, no chance to see Kanchanjungha). “La”, I replied. Though I felt that everybody in the car got a bit upset by I knew my luck to see Mt. Kanchanjungha. Mt. K never betrayed me. Even in my Lamahatta trip, where it was only me in the team who saw Mt. Kanchanjungha just for 2minutes. Meanwhile our car to turn from 3 Mile Mor and entered into Sinchal Forest. Finally, we reached at Khalling Cottage at around 12.30pm. This is the best home stay ever I have stayed in my life. The interior decoration reflects the taste of Rai family. Every corner of the cottage contains the ethnicity of Nepal. By that time rain was stopped. After getting freshened up, had a wonderful lunch and planned to roam around the tea garden. But nature had a different idea. The rain started again. Rain on a forest in a hill station!!! What more a person like me can expect!!! Myself with my sister went to the cottage owner Mr. Rai to have some chat. He is a nice gentleman with a pleasant personality. We talked for 2-3 hours. He said the history of the tea garden. Once upon a time in 19th century a British guy was looking for the best quality of tea. He chose this place for plantation. In 19th century and also early days of 20th Century, Rangaroon tea was served in Buckingham Palace. Next morning, we got up earlier and started walking around the village. The picturesque village is surrounded by the tea garden. Most of the villagers are jovial, educated and dignified. Tea garden and driving are the source of income for the villagers. It was a Sunday. So, people were celebrating the weekly off by doing domestic work and chit-chat. Personally, I love to interact with the villagers and always I have felt that people of North Bengal and Sikkim respond to me in a very positive way. This adds more pleasure in every trip. I experienced the same warmth of local people in this trip also. A young girl took me and my sister to the gate of the factory. She explained the entire process of making tea. She took us to the tea garden. I would suggest my fellow readers to have this experience. I had done it in my previous trips also. But every time I feel the same pleasure while walking along the lush green tea garden. I got a bit nostalgic. It might be due to the history of the garden. The soil of the garden is the silent speaker of the dream of a young British merchant. The tree plants are the proud mother as the leaves were used in Buckingham Palace. So aristocratic history the garden has!!! Meanwhile it was 12pm and we came back to resort for lunch. After lunch, we decided to trek to the jhora. We started walking towards it. But suddenly the weather betrayed and we came back. In the evening, I came out of the resort to have a fag. Suddenly I got surprised to see the opposite hill. Darjeeling hill is just to the opposite of Rangaroon Tea Garden. The city lights were glowing and it seemed like a golden neckless on the throat of a dark hill. It was the climax of the tour. The heavenly beauty made me spellbound for a long time when Mr. Rai asked me for dinner. While coming back, I was thinking that although it was a successful trip but we could not see Kanchanjungha. Suddenly our driver said, “saab dekho.” We all looked through the right window of the car and saw the clouds were getting disappeared. 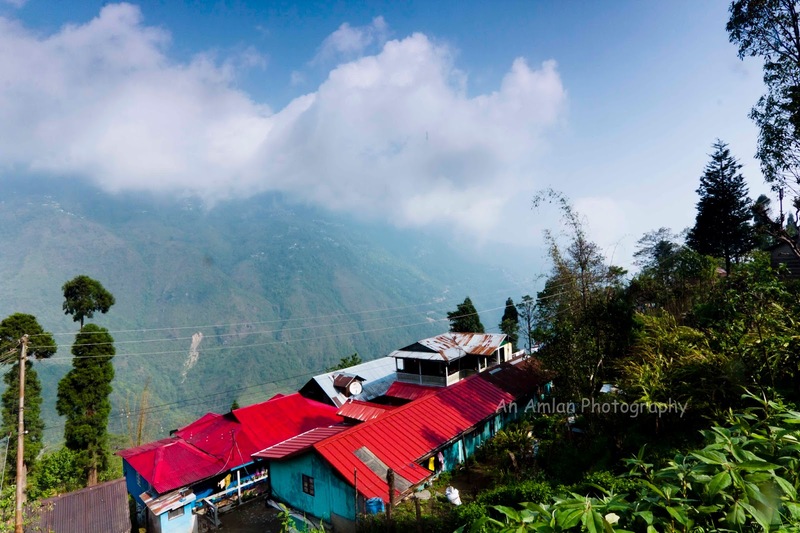 Within a few seconds Mount Kanchanjungha showed its face just like a crown on Darjeeling hill. Train to NJP or flight to Siliguri followed by car from Siliguri/ NJP can reach you to Rangaroon Tea Estate by two ways – either from Hill Cart Road (Siliguri-Kurseong-Ghum) or from Teesta Bazar. You can also take a car from Darjeeling to Rangaroon Tea Garden. Khalling Cottage is the only place to stay at Rangaroon Tea Garden. good one amlan.keep it up. This place looks stunning, also looks similar to Sri Lanka tea fields, which are so familiar to me. The pictures are stunning, looking forward to explore this place.